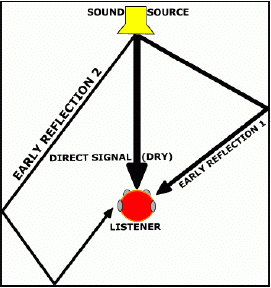 Early reflections are the echoes of a signal that arrive at the microphone within a stretch of about 30ms after the direct sound. Early reflections are direct copies of the direct sound source, rather than diffuse mixtures as are present in the late reflections, or reverberation, or a sound source. They are often visualized as shown in the figure. Early reflections add color to the sound source, and are critical for our understanding of distance in a 3D sound field. A signal with strong early reflections will still sound distant, warm, and generally “roomy” despite the complete elimination of late reflection. Therefore, it is imperative that any dereverberation algorithm focusing on voice quality enhancement deal with these distinct early reflections separately. As the figure shows, higher side lobes are exactly what we see. 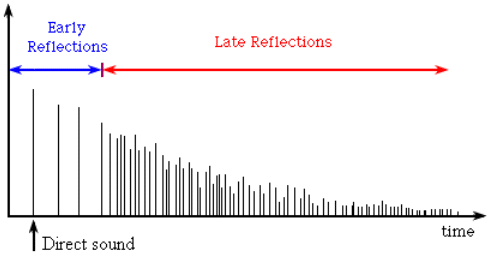 Since early reflections are just that, early, the effect becomes less pronounced as time lag is increased. The first sidelobe is the most affected, as expected, while this particular sample has a relatively strong reflection in the third sidelobe. This translates into reverberant autocorrelations having higher energy than clean ones, regardless of the presence of noise. In a dereverberation algorithm for voice quality enhancement, it is important that early reflections are handled. Here we will discuss the three most widely used methods for dealing with early reflections and thereby reducing coloration and the perception of distance. output. We want to only select lags in a set Τ as to ensure we aren’t cancelling the signal by filtering out the reflection at lag zero, which is the signal itself. Similarly, we can reduce the computational complexity by only focusing on those τ ∈ Τ that contribute substantially to coloration, such as those in some neighborhood of the sidelobe peaks. Where m represents the short time frame index, and k represents the discrete frequency bin index. reports that good results were obtained with μ = 0.0004 and H[0, : ] = [1,…,0]Τ . Also in , the authors used a Modulated Complex Lapped Transform in place of an FFT. As  illustrates, the the MCLT can be implemented by first performing an FFT and then performing a simple subband weighting. Actually, any invertible Gabor transform will work, for instance the Invertible Constant Q, Wavelet Transforms, and the Bark and Mel Transforms. Early reflections being picked up by a microphone are the principle cause of the perception of distance in an audio signal. Early reflections are modeled as sparse high energy impluses in the room impulse response, and have been shown to appear as extra energy in the first few peaks of the signals autocorrelation. 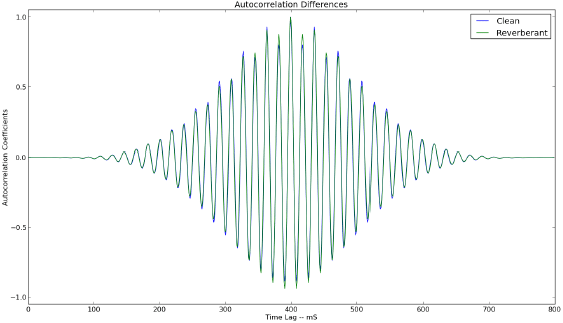 Two methods for early reflection cancellation are autocorrelation shaping, and kurtosis maximization, which can both be implemented adaptively. When combined with a method for dealing with late reflections, a complete dereverberation method is created. A. Oetzmann, D. Mazzoni, Reverb.” Internet: http://audacity.sourceforge.net//manual – 1.2//effects reverb.html,” Jan.28, 2005 [May. 3, 2013]. B.W. Gillespie, H.S. Malvar, and D.A.F. 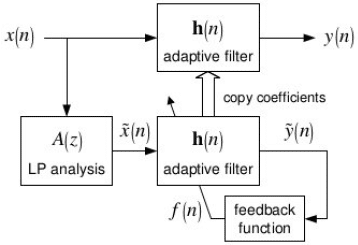 Florencio, Speech dereverberation via maximum-kurtosis subband adaptive filtering, in Proc. Int. Conf. Acoust., Speech, Signal Processing, vol. 6, pp. 3701-3704, 2001. H.S. Malvar, Fast Algorithm for the Modulated Complex Lapped Transform, Microsoft Corp., Redmond, WA, MSR-TR-2005-2 , 2005.